Background: The progression of fungal infections can be rapid and serious due to compromising with immune function. They may cause liver damage, affect estrogen levels or may cause allergic reactions. Oxiconazole nitrate (OXZN) is a broad spectrum commonly used antifungal drug. It acts by erogosterol biosynthesis inhibition, which causes lysis of the fungal cell membrane because of changes in both membrane integrity and fluidity and direct membrane damage of fungal cells. However, its poor water solubility and short half-life (3-5 h) limit its applications. 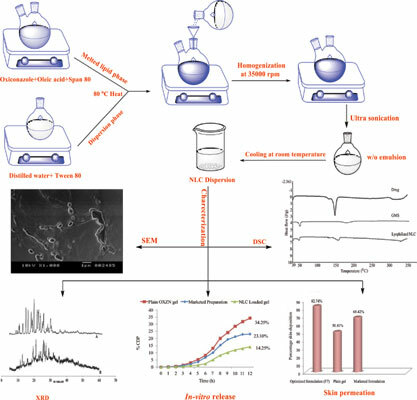 Objective: This study aimed to develop and evaluate OXZN-loaded nanostructured lipid carrier (NLC) to improve its solubility and prolong its release for the treatment of fungal infection via topical administration. Method: OXZN-NLC was prepared by ultrasonication method using 32 full factorial design. Glyceryl monostearate (GMS) (X1) and oleic acid (X2) were used as independent variables and particle size and percentage entrapment efficiency (% EE) as dependent variables. The OXZN-NLCs were characterized for particle size, particle morphology and entrapment efficiency. Results: The mean diameter of optimized OXZN-NLCs was found to be 124 ± 2 nm. Spherical shape and size were confirmed using scanning electron microscopy (SEM). Skin deposition study showed about 82.74% deposition as compared with the marketed formulation that showed 68.42% deposition. The developed NLCs show a sustained release pattern and high drug disposition in the infected area. Conclusion: OXZN-NLC could be a potential alternative for the treatment of topical fungal infection after clinical evaluation in near future. Keywords: Nanostructured lipid carrier, oxiconazole nitrate, solid lipid nanocarrier, statistical optimization, topical fungal infection, Glyceryl monostearate. Keywords:Nanostructured lipid carrier, oxiconazole nitrate, solid lipid nanocarrier, statistical optimization, topical fungal infection, Glyceryl monostearate. Abstract:Background: The progression of fungal infections can be rapid and serious due to compromising with immune function. They may cause liver damage, affect estrogen levels or may cause allergic reactions. Oxiconazole nitrate (OXZN) is a broad spectrum commonly used antifungal drug. It acts by erogosterol biosynthesis inhibition, which causes lysis of the fungal cell membrane because of changes in both membrane integrity and fluidity and direct membrane damage of fungal cells. However, its poor water solubility and short half-life (3-5 h) limit its applications.